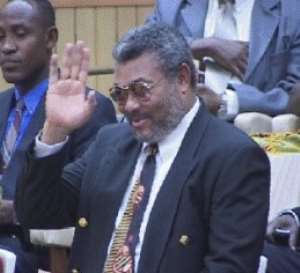 Chronicle -- Ex-president Rawlings yesterday told his audience in Nsawam in a blitzkrieg of a campaign with candidate Atta Mills that he had ruled Ghana for 19 years, and therefore had no intention or appetite to return to power at all. He dismissed reports that he was eager to reoccupy the castle and was only using Atta Mills as a surrogate. Though Professor Mills was also campaigning within the town, he strategically stayed away from the same platform as Rawlings who was waging a spirited, virulent attack on the New Patriotic Party (NPP) and the presidential candidate of the party. The ex President echoed the now familiar phrase that used to be the clarion call of the ruling party – “hwewo asetena mu….”, and challenged his audience to compare their present circumstances to what pertained during the New Democratic Congress (NDC) administration, urging them to vote for Professor Atta Mills. The president recalled that the NPP administration had supervised corruption, adding that the canker had eaten deeper into society than ever before in the history of the nation because the leadership was corrupt. Then he went into unprintable details and name calling, stirring the huge crowd that had assembled to listen to the NDC's prized 'showboy' who showed no sign that he had been affected by the buzz over his altercation with the DCE for Bongo, and reports that he was being sought to answer charges of assault.